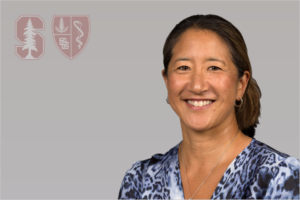 Debbie joined the Stanford Sports Medicine department as a staff physical therapist in January 2014. She has a strong background in manual therapy and functional rehabilitation. Prior to joining the Farm, Debbie worked in a vast array of facilities, including Children’s Hospital (Boston), Kerlan-Jobe Orthopedic Clinic (CA), UC Irvine Department of Athletics (CA), UCLA Department of Athletics (CA), and Agile/Excel Physical Therapy (CA). She has more than 15 years of experience working in Division I college athletics, as an athletic trainer/physical therapist working with football, swimming and diving, gymnastics, water polo, soccer, basketball, and tennis. She provides care for all 36 varsity sports programs at Stanford. “Management of Fractures” Physical Rehabilitation: Evidence Based Examination, Evaluation & Intervention.